The name says it all at Go Easy Villa. This villa enjoys water and island views, a gourmet kitchen, numerous living areas, and its own tennis court and gym. The beach is just a five minute’s drive away, and Sugar Hill Resort’s restaurant, Clubhouse, and communal tennis courts are all within reach. 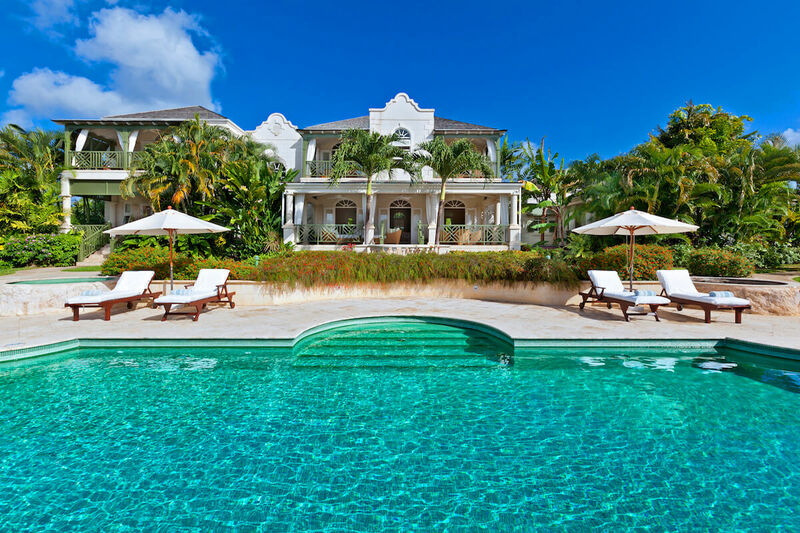 Go Easy offers breathtaking ocean views and a premiere location in Sugar Hill Estate, a gated resort community near the west coast of Barbados. This luxury resort villa sits on 1.5 acres of landscaped tropical gardens, and comprises a Main House and Guest Cottage. A large infinity-edge pool, Jacuzzi, and white stone deck create space for guests to relax and unwind. The deck features loungers, umbrellas, a wet bar, and an impressive 48” built-in gas barbecue, so it’s an ideal spot for cocktails and casual poolside feasts. A tennis court is steps away from the pool, and Go Easy is one of two Sugar Hill villas with this amenity. Tropical foliage surrounds the marble dining table, and the sound of trickling water beneath a nearby bridge elevates relaxation. A short staircase leads up to the veranda furnished with cushioned sofas, dining sets, and breezy curtains; the veranda connects the indoor and outdoor spaces. A grand staircase and wrought-iron chandelier cover the entryway in luxury, and the Great Room follows suit. This air-conditioned space is well-stocked with books and games, a piano, and a glass-topped coffee table. The gourmet kitchen is outfitted with stainless steel appliances, granite countertops, a wine cooler, and access to the dining gazebo. Nearby, the air-conditioned family room provides video/audio entertainment, a comfy sectional, and a home office. Go Easy also has a large fitness facility with cardio machines, resistance equipment, and free weights. Go Easy’s Main House has four spacious, king bedrooms with private balconies, air-conditioning, and marble-tiled ensuite bathrooms. Three of the bedrooms have four-poster beds, and one also has a day bed. Each suite has a fridge, tea/coffee making facilities, and a dressing room with a safe and hairdryer. The Guest Cottage features two air-conditioned twin bedrooms, and both can be converted into king suites. These bedrooms each have their own bathroom and share a fully-equipped kitchen and shaded patio. The villa is staffed with housekeepers that keep the property spotless, service bedrooms and bathrooms each morning, and launder any clothes as requested. Full bookings include a cook and chef. Go Easy benefits from a number of resort amenities including a Clubhouse, acclaimed restaurant, two communal swimming pools, and four championship tennis courts. Sugar Hill is also near Alleynes Bay, Colony Club Beach, and Reeds Bay. Bedroom 5 : The twin beds can be converted to a king bed upon advance request. Bedroom 6 : The twin beds can be converted to a king bed upon advance request. Complimentary cook services with full house bookings, assistant cook provided with 4 bedroom bookings only, and butler service provided with full house bookings during winter and Christmas seasons.